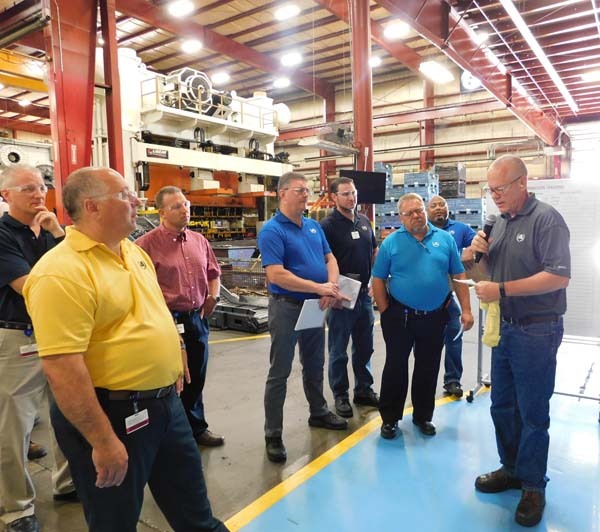 Anchor Manufacturing Group, Inc., a Cleveland-based metal stamping company, won the 2018 Zierick Manufacturing Corporation Productivity Award for productivity gains realized from its whiteboard tracking and walkabout program. The walkabout is a daily walk that engages members from each discipline throughout the plant and involves reviewing the most recent information from all whiteboards. Photo courtesy of PMA/Anchor Manufacturing Group. Two companies and an educational institution are recognized for their achievements in productivity, process control, innovation and technology, and training and education. CLEVELAND, Ohio—Anchor Manufacturing Group, Inc., of Cleveland, Ohio, and Pridgeon & Clay, Inc., of Grand Rapids, Michigan, each received two awards from the Precision Metalforming Association (PMA) as part of PMA’s 2018 Awards of Excellence in Metalforming. The annual awards, presented in November at the FABTECH tradeshow in Atlanta, recognize the high standards of achievement set by metalforming industry organizations in the areas of design, quality, innovation and technology, training and education, process control, product development, and productivity. The winning entrants were Anchor Manufacturing Group, Inc. (Cleveland, Ohio), winner of the Zierick Manufacturing Corporation Productivity Award and the Plex Systems Innovation and Technology Award; Pridgeon & Clay, Inc. (Grand Rapids, Michigan), winner of the Link Systems Process Control Award and the A.R. Hedberg Training and Education Award; and Rocklin High School (Rocklin, California), which took home the Clips & Clamps Industries Educational Institution Award. Winners were honored with a special plaque, commemorative flag, and a cash prize on November 5, 2018, during the FABTECH tradeshow in Atlanta. The Precision Metalforming Association represents North America’s approximately $137 billion metalforming industry, providing advocacy, networking, and statistical information to its more than 800 member companies. The association’s member companies create precision metal products using stamping, fabricating, spinning, slide forming, and roll forming technologies. They also include suppliers of equipment, materials, and services to the industry. Following are summaries of the accomplishments that were recognized as winners of the 2018 Awards of Excellence in Metalforming. Anchor Manufacturing Group, Inc., a Cleveland-based company that specializes in appearance and decorative stampings, high-strength aluminum and steel components, stainless-steel exhaust products, and safety-critical parts, received the 2018 Zierick Manufacturing Corporation Productivity Award. The award recognizes outstanding achievement by a manufacturing company in the development and implementation of programs, processes, and use of assets that lead to significant improvements in productivity. It is one of eight Awards of Excellence in Metalforming presented by PMA. Anchor Manufacturing won the award for productivity gains realized from its whiteboard tracking and walkabout program. Anchor’s whiteboard tracking contains three functional tiers. The first layer, hourly-tracking boards, is implemented on new-project-launch work centers; work centers that need improvement; and high-volume, high-revenue work centers. Hourly boards show specific information, such as the currently running part number, expected hourly and cumulative rate each hour, and the actual hourly and cumulative rate each hour. They also show the amount of scrap and rework each hour, and downtime minutes and reasons each hour. Supervisors must sign off on the whiteboard each hour, guaranteeing that they know what is going on at each work center and allowing them to react immediately to any problems. The second tier, level-one boards, also is implemented on new-project-launch work centers; work centers that need improvement; and high-volume, high-revenue work centers. These boards provide a slightly bigger picture than the hourly tracking boards, as they track daily and monthly data. The third tier, level-two boards, provides high-level measurement and analysis. These boards are used departmentally, and they also track items such as safety-related incidents, quality issues, premium freight costs, and more. The walkabout brings everything together in Anchor’s productivity program. This daily walk begins at work centers containing hourly tracking and level-one boards and ends at the level-two board meeting area. The walk engages members from each discipline throughout the plant and involves reviewing the most recent information from all whiteboards. It makes everyone aware of what is happening at each work center, in each department or work-center category, and plant-wide. The walkabout is not just about presenting information, but also about ensuring that things are heading in the right direction. It’s also about establishing future action plans, ensuring that there is full transparency into issues, and that these issues are being owned and resolved. As a result of Anchor’s whiteboard tracking and walkabout program, the company realized a projected annual savings of $668,000 from plant-wide scrap reduction and productivity increases. Anchor reported that it went from a plant-wide scrap rate of 2.6 percent in the fourth quarter of 2017 to a rate of 1.7 percent at the end of the second quarter of 2018. During this same period, Anchor went from plant-wide direct-labor-earned hours, to hours worked of 71.3 percent to 74.6 percent, resulting in a 4.5 percent increase in labor efficiency. Additional program benefits are reported to include increased departmental cohesiveness and improved employee awareness and morale. Anchor (www.anchor-mfg.com) said on its website that its core expertise includes small-to-large metal stampings and complex welded assemblies for a variety of automotive applications, such as Class A appearance trim and structural, exterior, interior, and exhaust components. Applications are also reported to include NVH (noise, vibration, and harshness), ride control, seating, steering column, brake, chassis, and safety-related components. The Productivity Award is sponsored by Zierick Manufacturing Corp., of Mount Kisco, New York. Pridgeon & Clay, Inc., of Grand Rapids, Michigan, received the 2018 Link Systems Award for Excellence in Process Control. The company was recognized for its development of a Poka-Yoke process to detect missing or incorrectly installed reinforcement tabs on an automotive heat shield. 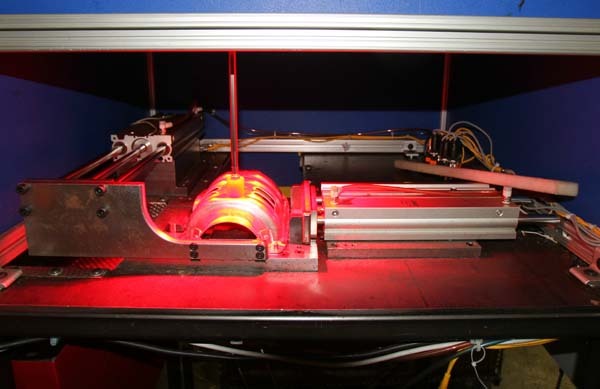 The process includes automation, pneumatics, and different types of sensors to inspect the part, and is said to provide a return on investment within one year. Pridgeon & Clay, Inc., of Grand Rapids, Michigan, received the 2018 Link Systems Award for Excellence in Process Control. The company was recognized for its development of a Poka-Yoke process to detect missing or incorrectly installed reinforcement tabs on an automotive heat shield. Photo courtesy of PMA/Pridgeon & Clay, Inc.
Pridgeon & Clay’s recently formed Error Proofing Lab employs two engineers who are dedicated to providing innovative process improvements, cost reductions, and quality enhancements. The lab performed a complete process review for the heat shield and considered alternatives for controlling the process. Visually sorting the parts could lead to human-error issues with a probability that the customer would receive non-compliant parts. Implementing an inspection system inside the tool would require updates, a costlier process than building a Poka-Yoke. The Poka-Yoke incorporates the use of automation, pneumatics, and different types of sensors, including proximity, through-beam, and vision sensors. In practice, once a part is run through the tab-installation die, it is placed into the Poka-Yoke by the press operator. The part locates within gauging onto pilots that provide solid orientation. An optical touch button activates the machine and a safety-light-curtain assures the Poka-Yoke is clear of personnel before starting. As the inspection begins, a pneumatic hold-down places pressure onto the part, maintaining its position. A proximity sensor confirms the part presence, and then a vision sensor collects an image and compares it to a stored image. If the image percentage is correct, the part passes the inspection. Next, the pilots are pneumatically removed from the part, the hold-down cylinder retracts, and the part is pneumatically shuttled forward down a chute, passing a through-beam sensor to assure the proper exit of the part. Parts are batch counted by the programmable logic controller (PLC). The machine then resets the pilots to load the next part. Inspection takes only a few seconds and, once it is initiated, the operator is free to load the next assembly into the die. Should an inspection fail, the bad part is shuttled left down a chute, passing by a through-beam sensor into a locked box. If the PLC counts five bad parts, it notifies the operator of the fault. The press will not operate until a department leader is notified to identify the problem and resets the machine. To explain the complete Poka-Yoke process, Pridgeon & Clay’s Error Proofing Lab created a training program where personnel were trained to program and troubleshoot the machine. Backup programs are stored on the company’s computer network and can be downloaded if sensors are replaced to enable a rapid Poka-Yoke restart. The Poka-Yoke installation and application cost was $20,000. The return on investment (ROI) for this specific part is approximately $25,000 annually, due to elimination of the former sort process. Over the life of the part, ROI is projected to be $105,000. The Process Control Award, sponsored by Link Systems, of Nashville, Tennessee, promotes the application of electronic-analog closed-loop process controls in the metalforming process. 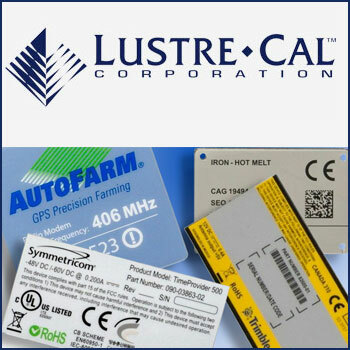 It does so by recognizing innovative electronic solutions implemented by a North American manufacturing company that have resulted in significant quality, cost reduction, and/or productivity improvements. Anchor Manufacturing Group also won the 2018 Plex Systems Innovation and Technology Award. The company was recognized for implementing software that aids the company in attaining accurate, real-time data for use in streamlining work for employees at all levels. The Innovation and Technology Award is sponsored by Plex Systems, Inc., of Troy, Michigan. It recognizes a metalforming company that has implemented cloud technology to drive innovation from a product or business perspective, transform business operations, or scale and grow from a size or product perspective. Recognizing the importance of collecting data and the negative consequences of acting on inaccurate data, Anchor decided to implement Ignition software from Inductive Automation. Key software functions employed by Anchor include supervisory control and data acquisition (SCADA), data reporting, and dashboarding. Because it can connect with a wide variety of device types, the software enables Anchor to capture real-time data easily, no matter what type of equipment produces the target data. And, because Ignition is web-based, Anchor easily can access data, reports, and dashboards anywhere via a PC or mobile device. The first phase of implementation tackled the human-machine interface (HMI), enabling ease of access and use for employees throughout the company, and seamless integration with Anchor’s other resource-planning and data-producing systems. Other implementations followed, allowing for capture and use of real-time data. For example, due to the Ignition project, Anchor’s dashboards now reflect real-time information. In the past, the company used TVs and PC modules to display work center information such as status, count, efficiency, overall equipment effectiveness (OEE), or other key machine-performance indicators. But the information displayed was only as current as the most recent production recording. In some cases, production was recorded only once or twice per shift. As a result, displayed information offered little value because it didn’t represent the current situation of the work center. Now, dashboards and other modules used to view work-center information relay real-time conditions to all interested parties. This allows Anchor employees to react to issues much more quickly and improve conditions before they spiral out of control. In the testing phase of the project, Anchor ran the HMI offline, in parallel with the standard way that operators recorded production and machine statuses for one shift. On one piece of equipment, according to the data logged by the operator, the machine was down for 54 minutes in that period. Ignition revealed that the machine was actually down for 94 minutes. The difference of 40 minutes is quite significant, especially considering the testing covered only one shift of 7.5 hours. Implementation of Ignition has benefitted operators by providing real-time performance awareness and easier status updates. Management has benefitted through enhanced data acquisition and access to timely information. Overall, the company has gained a better understanding of current performance that allows for targeting of specific areas in need of improvement. It also can expand data collection and control in the future. Pridgeon & Clay, Inc., also received the 2018 A.R. Hedberg Training and Education Award. Founded in 1948 by John Pridgeon and Donald V. Clay, the company is a family-owned, global manufacturer of complex stamped, fine-blanked parts and welded assemblies. Pridgeon & Clay is a Tier-Two supplier to the global automotive market. Pridgeon & Clay (P&C) won the award for its CORE training program, developed in 2017 by a team of subject matter experts, the company’s training department, and executive leadership. The group was guided by an outside consultant that specializes in training specifically for automotive stamping companies. The objective of the program: Emphasize that P&C is a metal stamping company and that each person and process within the organization has an effect on output. CORE training consists of nine basic courses that highlight specific gears of the organization—P&C Business Overview, Metallurgy, Energy, Presses, Dies, Welding, Quality, 5S, and Lean Thinking. Courses are taught as a two-day, seminar-style training session in the company’s renovated training room. Sessions comprise small groups of approximately 16 attendees from different areas, departments, and shifts within the organization. Each one-hour-long CORE course includes a Q&A and a short test, except for the CORE P&C Business Overview course, which is two hours long. Training ends with verbal feedback, takeaways, Q&A, and a graduation ceremony. CORE training is designed for all employees. Each session includes a mixture of individuals from all levels of the organization, and all shifts and roles. At the end of every CORE session, executive leadership presents each graduate with a certificate and gift. The CORE training program is reported to have yielded many benefits, including employee growth and development, an enhanced understanding of the business, and a heightened focus on quality and safety awareness. Benefits are also reported to include increased collaboration with different areas of the organization, positive morale, continuous improvement, and a skilled workforce. Currently, CORE is offered in P&C’s Grand Rapids plant, which consists of 973 of the company’s 1,469 global employees. The company plans to roll out the CORE program to its other sites in the future. The Training and Education Award recognizes a company’s use of a comprehensive training program to accomplish an outstanding achievement in employee technical education. The award is sponsored by HPL Stampings, Inc., of Lake Zurich, Illinois, in memory of A.R. (Ray) Hedberg, a leader in employee training. As the winner of the award, Pridgeon & Clay received a $1,500 cash prize, which the company said it would present to the robotics program at Wyoming High School, in Wyoming, Michigan. Rocklin High School, of Rocklin, California, received the 2018 Clips & Clamps Industries Educational Institution Award for its outstanding engineering program, dedicated to enhancing the student experience through hands-on educational opportunities. Focused on computer-controlled technologies, the school’s shop is a modern, state-of-the-art facility almost completely funded through grants. Rocklin High School (RHS) instructor Dan Frank has secured more than $1.2 million in the last 10 years to build the shop. Rocklin High School has built enduring relationships with many industry partners, including Autodesk, UC Davis (Biological and Agricultural Engineering), Haas Automation, Kennametal, NASA (HUNCH), Titans of CNC, and many local shops. Titans of CNC, best known for its television show and its Titans of CNC Academy, has been the school’s most prominent partner, and RHS was the test bed for the academy. Recently, RHS signed a contract to produce flight-ready parts for the International Space Station through the NASA HUNCH program, becoming the third school in California certified by NASA to produce parts. The RHS Engineering curriculum includes four courses. The first-level course introduces a broad variety of tools and technologies to the students, and they learn to safely use every piece of equipment in the shop and in the design lab. The second course addresses skill development, during which the Titans of CNC Academy is implemented, and students build their CAD, CAM, and CNC skills. The third course focuses on robotics, during which students design a 120-pound robot for the First Robotics Competition, an international robotics competition. The final course focuses on students designing and developing their own projects or managing a variety of job-shop-style projects from internal and external customers. In addition to the four-course sequence, RHS offers other methods for students to engage more deeply with the program. A peer-teaching option is available for students wanting to mentor other students. A teaching assistant course is offered for those interested in facility operations, and a special-projects course is available for students wanting to dig into larger projects (such as go-carts). Each of these options enhance the students’ experience. Through the support of industry partners and local machine shops, Rocklin High School has been able to help its students find gainful employment, go to college, or both. Many graduates also have started their own machining companies. The Educational Institution Award recognizes a public or private educational institution that provides outstanding training and education services to companies in the metal forming industry. The award, which includes a cash prize, is sponsored by Clips & Clamps Industries, of Plymouth, Michigan, and funded by the Dul Foundation. More information on PMA’s Awards of Excellence in Metalforming is available at www.pma.org.